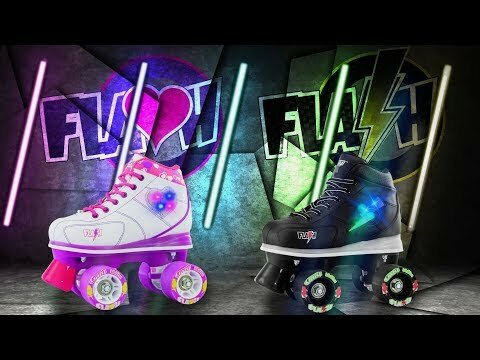 FLASH - our High Top sneaker style skate with motion activated LED Light Up flashing sole and lightning bolt on each skate will capture the attention of any bystander as you 'flash' by - now with a replaceable battery to ensure you flash for years of skating! Perfect for any skill level or age| the FLASH is a skate product that matches it's great eye-catching looks with comfort and performance. Fitted with quality ABEC 3 bearings and signature speed hub wheels| choosing to skate indoor or outdoors is an option without sacrificing speed or grip. Urethane toe stops ensure a safe| fast and efficient brake method on each skate (not likeplastic that can slip)| two tone laces| padded tongue| nylon plates complete the sporty look for the all new FLASH.